The Clay: Studio by Sculpey clay will no longer be available. I suspect the polymer clay community's backlash over the Donna Dewberry thing got the brand off on the wrong foot. But it was probably the tightening restrictions on phthalates (which Studio by Sculpey still included) that dealt the final blow. I personally liked the clay well enough for certain things. If I wanted to do a quick project, the fact that the colors looked great straight from the package was nice. I also liked the suede-like finish of the clay (though mixing UltraLight and Premo can give similar results). And I discovered as I was writing my book that Studio by Sculpey worked better than any other clay currently on the market for the tearaway image transfer technique. But I never felt like the clay had quite the right softness for me — it was either too soft or too crumbly, depending on its age. So while I'm not heart-broken about the clay, I did stock up when my local Hobby Lobby put it on clearance. 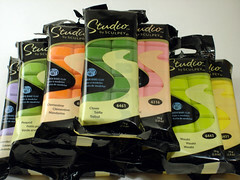 The good news is, Polyform says they'll make color recipes available for the Studio by Sculpey colors in mid-November. Texture Makers: The Studio by Sculpey Texture Makers sheets are also being discontinued, at least most of them. Three textures — lace, alligator and swirls — are now available in a smaller size sheet under the Sculpey brand name. The texture wheel will also be available under the Sculpey name. I was a little sad about this one. I liked that these texture sheets were see-through and flexible. I liked the size and the range of patterns. And I really liked the two grid texture sheets, and have had a hard time finding anybody else making anything similar. Glaze: Talk about things that make me sad! I couldn't tell from the website whether the Studio by Sculpey glazes were being re-branded or discontinued. However, in the class I took with Christi Friesen last weekend, she said she had ordered some of the Sculpey Satin Glaze to check... and it's still the old goopy stuff. So it doesn't look like they're re-branding the Studio by Sculpey glazes. [Update: I confirmed this with Polyform. The glazes are definitely discontinued.] I dislike the Sculpey glazes so much, but I didn't realize how universal that dislike was until I started telling people about the Studio by Sculpey glaze. I wish Polyform had made a different decision. FYI, I haven't seen any official lists on what's being discontinued and what's being rebranded, so the above is compiled from Facebook announcements, emails with Polyform, and my own comparison of the product listings on the Polyform website. (As a side note, I discovered after recently joining Facebook that their page is just about the best place to find Polyform announcements. It's certainly a better source than their website or their long-neglected email newsletter.) So if you think I've overlooked something, please let me know in the comments. In other news, ‎Polyform announced that in 2011 they will be releasing new Premo colors for the first time since they started the Premo line in the late 1990s. The announcement didn't specify how many colors or what they would be — it just said to "look forward to luscious, new colors." One wonders whether they're adding a few of those nice Studio by Sculpey colors...? They also said they're releasing 11 new Sculpey III colors. Info on which Studio by Sculpey products are being discontinued and which ones are being re-branded. Also includes Premo's announcement about new colors. Argh I LOVE the antiquing medium, of all things. But you're right, the clay consistency was "kind of not quite right" in some indefinable way. Rachel - I should say the antiquing medium is the one I found the least info about. If it were being re-branded under the Sculpey line, I would expect it to be listed on the Sculpey Finishes page, which has as this as its description, "Enhance the appearance of your clay creations with glazes and antiquing mediums." You'd think with a description like that, they would have some sort of antiquing medium listed... but they don't. Of course, they didn't appear to have the antiquing medium listed under the Studio by Sculpey categories either. So maybe they never got around to putting it on their website at all! Since it's a little unclear, I've got a question in with the Polyform folks to see if they can tell me for sure. That's a bummer :(. I find the Fimo colours too garish, though I agree with the comments about the consistency of Studio Sculpey....oh well, I guess that just means I'll have fun playing with new brands :). I found a lot of those items with the new labels in the Michaels store some time ago. I wonder if they ask professional polymer clayers as to what they should keep and not rather than still assuming that it is only for children or people who only sculpt. Someday they will hopefully get the message. @Gaina Thanks for the comment! New brands can definitely be fun. If you're looking for good straight-from-the-package colors, a lot of folks like the Pardo clay. You might give it a try. @Carolyn I wonder too how companies like Michael's make those decisions, and whether there's a way to make requests for specific products. On the plus side, it seems like -- at least at the craft stores I've been to lately -- they're expanding their polymer clay offerings in a positive direction. And I'm oh-so-thankful that online shopping means we're able to get the things they don't carry! @Rachel I heard back from Polyform on the antiquing mediums. Turns out they were already discontinued (over a year ago), so that's why the website didn't list them at all. I made a note of that in the original post. The Polyform gal also pointed out that the acrylic roller is being re-branded, not discontinued. Turns out it wasn't on the site because it's waiting for a new photo. But she confirmed that the glazes are discontinued (sad, sad). @Angela Thanks for the tip! I'll have to see if I can find a supplier in the UK :). so I don't see why Sculpey can't do the same thing. Hi You mentioned using Premo and Ultra Lite to get a suede finish. How many parts of each ? Patt: My favorite mixture -- the one I personally feel gets the best of both brands -- is 2 parts of Premo to 1 part of UltraLight. More UltraLight would give you more of the "soft" texture, so you might adjust that depending on your project. I've done some projects 50/50, but that mixture is generally a little too "mushy" for my tastes. Good luck! When you say "Studio by Sculpey worked better than any other clay currently on the market for the tearaway image transfer technique," do you mean you used something like "Buttercream" straight out of the package (as opposed to mixing clays)...as you do in your book? Yes, Karen. In my experiments, straight Studio by Sculpey was most reliably successful for the tear-away technique. I thought I read this tip on Glass Attic, but I can't find the source now. The theory was that the phthalates in the clay were what made it work well. Since the Studio clay is discontinued, I would recommend a very well-conditioned and warm light color of Premo. Out of curiosity, what did Donna Dewberry do and or say that recieved backlash? I'm curious because I keep hearing about it and I can't find anything about what happend and lead to Polyform dropping her. I don't *think* there was any specific incident. There was a perception that Polyform capitalized on a "name" from another media (Dewberry's One Stroke techniques), instead of using a known polymer clay artist. I think there was also a strong reaction to the fairly expensive certification process, where one had to pay to be a certified Studio by Sculpey teacher. That was intensified by the idea that folks were paying all that money to learn how to teach polymer clay from someone that was perceived as an outsider. (Of course, all of this is just my fuzzy remembrance of the complaints I read years ago on some Yahoo groups!) Don't know how much that initial backlash to the clay led to its poor market performance, but I'm sure it didn't help. Good to hear from you, Janet. Are you talking about one of their Shape Makers sets? I just tried doing a search as well & didn't find anything. Wish I could help, but I never got one of those. Sorry. Yes, the baby's getting big and thinking about learning to crawl. Oh, my, will we have our hands full soon. Take care!